Click the button below to add the LabVIEW Physical Computing Kit for BeagleBone Black (LIMITED TIME) to your wish list. 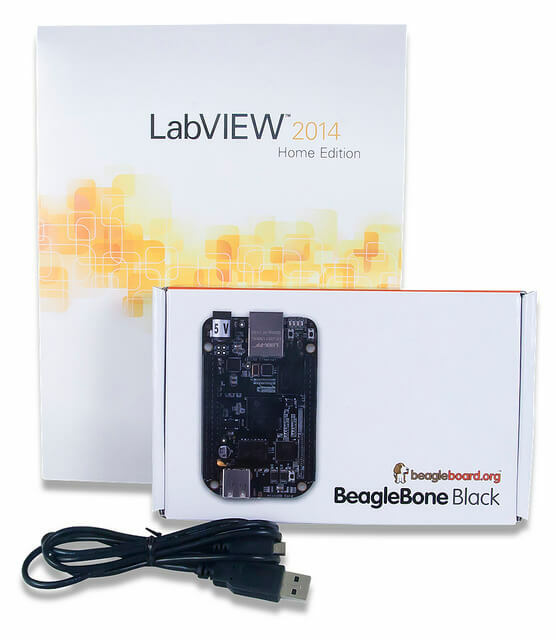 The LabVIEW Physical Computing Kit for BeagleBone Black is no longer in production. Once the current stock is depleted, it will be discontinued. We recommend migration to the standalone LabVIEW Home Bundle. That's why we've created the Physical Computing Kits. This version of the kit includes the popular BeagleBone Black Rev. C platform, combined with LabVIEW Home Bundle, it provides an inexpensive yet versatile way to deploy LabVIEW to an unconnected target and interact with the physical world! The BeagleBone Black is a low-cost, community-supported development platform that is perfect for physical computing applications. It has extensive I/O possibilities including PWM, on-chip Ethernet, micro HDMI and USB. The Rev. C model is a vast improvement over the previous BeagleBone, providing quick boot times and double the storage, making it the perfect choice for anyone wanting to migrate up from the chipKIT WF32 or Arduino projects. Take your project beyond your computer! With the powerful ARM Cortex-A8 processor on board the BeagleBone Black, you are able to run Debian Linux, which turns your BeagleBone Black into a mini-computer. Having a computer at your disposal allows users to deploy LabVIEW, using LINX 3.0. Unlike microcontroller targets, which require a PC connection, once programmed, the BeagleBone Black can be disconnected and will remain running. Robitics, remote sensor units, running large image processing walls (like our LED Display), and most projects that would require both a Raspberry Pi + a microcontroller. The BeagleBone Black is the best of both worlds! The BeagleBone Black is a powerful credit-card sized board that has a fast growing community and extensive capabilities! Now, imagine you want to expand your design. For instance, maybe you want to add a high / low temperature range or a digital temperature display. On a breadboard, it would mean adding parts, rewiring, testing, etc. In LabVIEW, experimentation like this is much, much more efficient. A tutorial series specifically for the BeagleBone Black. These tutorials can walk you through an introduction to the LabVIEW interface, programming examples, setting up your BeagleBone Black for deployment, connecting to I/O, and datalogging. I much like the Beagle Bone over Raspberry Pi. The addition of the analog signals was so great to have on board. As for LabView National Instruments has a tremendous product with so much power behind it. It is so great to finally afford it at home.